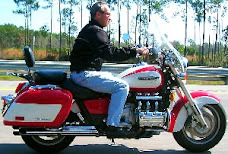 I'm soliciting comments about a web site I stumbled across: Motorcycle Touring Guide. If you have experience with it, please share. I plan to check it out over the next few weeks. I was frustrated this last summer not having a "theme" to focus our weekend rides (the previous summer I focused on suspension bridges in VA). Maybe this web site will be just the ticket for next summer? Electric Motorcycle Sets Speed Record: "Mission Motors, an electric motorcycle startup based in San Francisco, said Tuesday that its prototype vehicle had set a world speed record for battery-powered bikes of 150.059 miles per hour at the Bonneville Speedway in Utah." I mentioned in a previous post that electric motorcycles may be the future. Between then and now the ongoing efforts to eliminate manually using a clutch to shift gears will likely come to the fore. See below a posting about Honda's latest auto shifter for the next generation VFR. An interesting development that, I assume, is thought to help some potential motorcycle buyers who are uncertain about shifting manual transmissions. I'm not sure I'd ever buy one, but I would like to ride one of these modern marvels. Honda has announced their “Dual Clutch Transmission” for use in large displacement sport bikes. I read through the description of this new bit of technology and it’s pretty interesting, one clutch for odd gears, the other for even gears. Each clutch engages the next gear [...]"
During my last morning commute, waiting at a stoplight I noticed a grasshopper sitting on the roof of the car in front of me. He was towards the rear appearing to have his right foward leg holding on to the base of the car's roof mounted radio antenna. This will make for an interesting experiment: At what speed will the grasshopper be blown off the roof of the car? My guess was something around 35- to 40-mph. The light turned green and I kept an eye on my speedometer and the intrepid grasshopper as I shifted up through the gears. In no time I was up to 55-mph. The wind buffeted the grasshopper side to side. But he remained steadfast. I imagined hearing a small scream above the din of road noise. I was impressed. This continued through 3 more lights and I watched the brave hopper hang on as the car continued north when I turned west. I thought about that hopper for the rest of the day. It occurred to me that he had probably settled on the car's roof hoping to rest for a while. Instead of resting, he had to hang on for dear life heading to places unkown. Suffering hardship along the way, he is no different than any adventurer of any age. The only thing that would have made his experience more fitting would have been to do it on two wheels.